The great white shark (Carcharodon carcharias), also known as the great white, white pointer, white shark, or white death, is a species of large lamniform shark which can be found in the coastal surface waters of all the major oceans. The great white shark is notable for its size, with mature female individuals growing up to 6.1 m (20 ft) in length and 1,950 kg (4,300 lb) in weight. However most are smaller, males measuring 3.35 to 3.96 m (11 ft 0 in to 13 ft 0 in) and females 4.57 to 4.88 m (15 ft 0 in to 16 ft 0 in) on average. According to a 2014 study the lifespan of great white sharks is estimated to be as long as 70 years or more, well above older estimates, making it one of the longest lived cartilaginous fish currently known. According to the same study, male great white sharks take 26 years to reach sexual maturity, while the females take 33 years to be ready to produce offspring. Great white sharks can accelerate to over 56 km/h (35 mph) for short bursts. The great white shark has no known natural predators other than the killer whale. The great white shark is arguably the world's largest known extant macropredatory fish, and is one of the primary predators of marine mammals. It is also known to prey upon a variety of other marine animals, including fish and seabirds. It is the only known surviving species of its genus Carcharodon, and is ranked first in having the most recorded shark bite incidents on humans. The IUCN list the great white shark as a vulnerable species, while it is included in Appendix II of CITES. The bestselling novel Jaws by Peter Benchley and the subsequent blockbuster film by Steven Spielberg depicted the great white shark as a "ferocious man eater". Humans are not the preferred prey of the great white shark, but, nevertheless, the great white is responsible for the largest number of reported and identified fatal unprovoked shark attacks on humans. In 1758, Carl Linnaeus gave the great white shark its first scientific name, Squalus carcharias. Later, Sir Andrew Smith gave it Carcharodon as its generic name in 1833, and also in 1873. The generic name was identified with Linnaeus' specific name and the current scientific name, Carcharodon carcharias, was finalized. Carcharodon comes from the Greek words karcharos, which means sharp or jagged, and odous, which means tooth. The great white shark came into existence during the mid-Miocene epoch. The earliest known fossils of the great white shark are about 16 million years old. However, the phylogeny of the great white is still in dispute. The original hypothesis for the great white's origins is that it shares a common ancestor with a prehistoric shark, such as the C. megalodon. C. megalodon had teeth that were superficially not too dissimilar with those of great white sharks, but its teeth were far larger. Although cartilaginous skeletons do not fossilize, C. megalodon is estimated to have been considerably larger than the great white shark, estimated at up to 17 m (56 ft) and 59,413 kg (130,983 lb). Similarities among the physical remains and the extreme size of both the great white and C. megalodon led many scientists to believe these sharks were closely related, and the name Carcharodon megalodon was applied to the latter. However, a new hypothesis proposes that the C. megalodon and the great white are distant relatives (albeit sharing the family Lamnidae). The great white is also more closely related to an ancient mako shark, Isurus hastalis, than to the C. megalodon, a theory that seems to be supported with the discovery of a complete set of jaws with 222 teeth and 45 vertebrae of the extinct transitional species Carcharodon hubbelli in 1988 and published on 14 November 2012. In addition, the new hypothesis assigns C. megalodon to the genus Carcharocles, which also comprises the other megatoothed sharks; Otodus obliquus is the ancient representative of the extinct Carcharocles lineage. Great white sharks live in almost all coastal and offshore waters which have water temperature between 12 and 24 °C (54 and 75 °F), with greater concentrations in the United States (Northeast and California), South Africa, Japan, Oceania, Chile, and the Mediterranean. One of the densest known populations is found around Dyer Island, South Africa, where almost all of the shark research is done. According to a recent study, California great whites have migrated to an area between Baja California Peninsula and Hawaii known as the White Shark Café to spend at least 100 days before migrating back to Baja. On the journey out, they swim slowly and dive down to around 900 m (3,000 ft). After they arrive, they change behavior and do short dives to about 300 m (1,000 ft) for up to ten minutes. Another white shark that was tagged off of the South African coast swam to the southern coast of Australia and back within the year. A similar study tracked a different great white shark from South Africa swimming to Australia's northwestern coast and back, a journey of 20,000 km (12,000 mi; 11,000 nmi) in under nine months. These observations argue against traditional theories that white sharks are coastal territorial predators, and open up the possibility of interaction between shark populations that were previously thought to have been discrete. The reasons for their migration and what they do at their destination is still unknown. Possibilities include seasonal feeding or mating. The great white shark has a robust, large, conical snout. The upper and lower lobes on the tail fin are approximately the same size which is similar to some mackerel sharks. A great white displays countershading, by having a white underside and a grey dorsal area (sometimes in a brown or blue shade) that gives an overall mottled appearance. The coloration makes it difficult for prey to spot the shark because it breaks up the shark's outline when seen from the side. From above, the darker shade blends with the sea and from below it exposes a minimal silhouette against the sunlight. Great white sharks, like many other sharks, have rows of serrated teeth behind the main ones, ready to replace any that break off. When the shark bites, it shakes its head side-to-side, helping the teeth saw off large chunks of flesh. 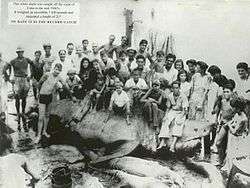 Specimen caught off Cuba in 1945 which was allegedly 6.4 m (21 ft) long and weighed an estimated 3,175 kg (7,000 lb). Later studies proved this specimen to be of average maximum size, at around 4.9 m (16 ft) in length. In great white sharks, sexual dimorphism is present, and females are generally larger than males. Male great whites on average measure 3.35–3.96 m (11.0–13.0 ft) long, while females at 4.57–4.88 m (15.0–16.0 ft). Adults of this species weigh 522–771 kg (1,151–1,700 lb) on average, however mature females can have an average mass of 680–1,110 kg (1,500–2,450 lb). The largest females have been verified up to 6.1 m (20 ft) in length and an estimated 1,950 kg (4,300 lb) in weight, perhaps up to 2,268 kg (5,000 lb). The maximum size is subject to debate because some reports are rough estimations or speculations performed under questionable circumstances. Among living cartilaginous fish, only the whale shark (Rhincodon typus), the basking shark (Cetorhinus maximus) and the giant manta ray (Manta birostris), in that order, average larger and heavier. These three species are generally quite docile in disposition and given to passively filter-feeding on very small organisms. This makes the great white shark the largest extant macropredatory fish. Great whites sharks are at around 1.2 m (3.9 ft) when born, and grow about 25 cm (9.8 in) each year. According to J. E. Randall, the largest white shark reliably measured was a 6.0 m (19.7 ft) individual reported from Ledge Point, Western Australia in 1987. Another great white specimen of similar size has been verified by the Canadian Shark Research Center: A female caught by David McKendrick of Alberton, Prince Edward Island, in August 1988 in the Gulf of St. Lawrence off Prince Edward Island. This female great white was 6.1 m (20 ft) long. 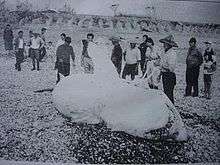 However, there was a report considered reliable by some experts in the past, of a larger great white shark specimen from Cuba in 1945. This specimen was 6.4 m (21 ft) long and had a body mass estimated at 3,324 kg (7,328 lb). However, later studies also revealed that this particular specimen was actually around 4.9 m (16 ft) in length, a specimen in the average maximum size range. The largest great white recognized by the International Game Fish Association (IGFA) is one caught by Alf Dean in the south Australian waters in 1959, weighing 1,208 kg (2,663 lb). Several larger great whites caught by anglers have since been verified, but were later disallowed from formal recognition by IGFA monitors for rules violations. To more successfully hunt fast and agile prey such as sea lions, the great white has adapted to maintain a body temperature warmer than the surrounding water. One of these adaptations is a "rete mirabile" (Latin for "wonderful net"). This close web-like structure of veins and arteries, located along each lateral side of the shark, conserves heat by warming the cooler arterial blood with the venous blood that has been warmed by the working muscles. This keeps certain parts of the body (particularly the stomach) at temperatures up to 14 °C (25 °F) above that of the surrounding water, while the heart and gills remain at sea temperature. When conserving energy the core body temperature can drop to match the surroundings. A great white shark's success in raising its core temperature is an example of gigantothermy. Therefore, the great white shark can be considered an endothermic poikilotherm because its body temperature is not constant but is internally regulated. Great whites also rely on the fat and oils stored within their livers for long-distance migrations across nutrient-poor areas of the oceans. 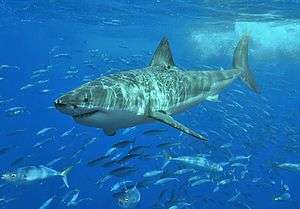 Studies by Stanford University and the Monterey Bay Aquarium published on 17 July 2013 revealed that In addition to controlling the sharks' buoyancy, the liver of great whites is essential in migration patterns. Sharks that sink faster during drift dives were revealed to use up their internal stores of energy quicker than those which sink in a dive at more leisurely rates. Great white sharks are carnivorous and prey upon fish (e.g. tuna, rays, other sharks), cetaceans (i.e., dolphins, porpoises, whales), pinnipeds (e.g. seals, fur seals, and sea lions), sea turtles, sea otters (Enhydra lutris) and seabirds. Great whites have also been known to eat objects that they are unable to digest. Juvenile white sharks predominantly prey on fish including other elasmobranchs, as their jaws are not strong enough to withstand the forces required to attack larger prey such as pinnipeds and cetaceans until they reach a length of 3 meters (9.8 ft) or more, at which point their jaw cartilage mineralizes enough to withstand the impact of biting into larger prey species. Upon approaching a length of nearly 4 meters (13 ft), great white sharks begin to target predominately marine mammals for food, though individual sharks seem to specialize in different types of prey depending on their preferences. They seem to be highly opportunistic. These sharks prefer prey with a high content of energy-rich fat. Shark expert Peter Klimley used a rod-and-reel rig and trolled carcasses of a seal, a pig, and a sheep from his boat in the South Farallons. The sharks attacked all three baits but rejected the sheep carcass. White sharks also attack dolphins and porpoises from above, behind or below to avoid being detected by their echolocation. Targeted species include dusky dolphins (Lagenorhynchus obscurus), Risso's dolphins (Grampus griseus), bottlenose dolphins (Tursiops ssp. ), Humpback dolphins (Sousa ssp. ), harbour porpoises (Phocoena phocoena), and Dall's porpoises (Phocoenoides dalli). Groups of dolphins have occasionally been observed defending themselves from sharks with mobbing behaviour. White shark predation on other species of small cetacean has also been observed. In August 1989, a 1.8-meter (5.9 ft) juvenile male pygmy sperm whale (Kogia breviceps) was found stranded in central California with a bite mark on its caudal peduncle from a great white shark. In addition, white sharks attack and prey upon beaked whales. Cases where an adult Stejneger's beaked whale (Mesoplodon stejnegeri), with a mean mass of around 1,100 kg (2,400 lb), and a juvenile Cuvier's beaked whale (Ziphius cavirostris), an individual estimated at 3 m (9.8 ft), were hunted and killed by great white sharks have also been observed. When hunting sea turtles, they appear to simply bite through the carapace around a flipper, immobilizing the turtle. The heaviest species of bony fish, the oceanic sunfish (Mola mola), has been found in great white shark stomachs. Off Seal Island, False Bay in South Africa, the sharks ambush brown fur seals (Arctocephalus pusillus) from below at high speeds, hitting the seal mid-body. They go so fast that they can completely leave the water. The peak burst speed is estimated to be above 40 kilometers per hour (25 mph). They have also been observed chasing prey after a missed attack. Prey is usually attacked at the surface. Shark attacks most often occur in the morning, within 2 hours of sunrise, when visibility is poor. Their success rate is 55% in the first 2 hours, falling to 40% in late morning after which hunting stops. Whale carcasses comprise an important part of the diet of white sharks. However, this has rarely been observed due to whales dying in remote areas. It has been estimated that 30 kg of whale blubber could feed a 4.5 m white shark for 1.5 months. Detailed observations were made of four whale carcasses in False Bay between 2000 and 2010. Sharks were drawn to the carcass by chemical and odour detection, spread by strong winds. After initially feeding on the whale caudal peduncle and fluke, the sharks would investigate the carcass by slowly swimming around it and mouthing several parts before selecting a blubber-rich area. 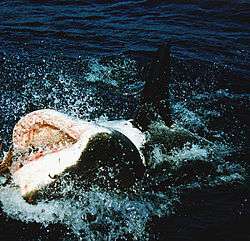 During feeding bouts of 15–20 seconds the sharks removed flesh with lateral headshakes, without the protective ocular rotation they employ when attacking live prey. The sharks were frequently observed regurgitating chunks of blubber and immediately returning to feed, possibly in order to replace low energy yield pieces with high energy yield pieces, using their teeth as mechanoreceptors to distinguish them. After feeding for several hours, the sharks appeared to become lethargic, no longer swimming to the surface; they were observed mouthing the carcass but apparently unable to bite hard enough to remove flesh, they would instead bounce off and slowly sink. Up to eight sharks were observed feeding simultaneously, bumping into each other without showing any signs of aggression; on one occasion a shark accidentally bit the head of a neighbouring shark, leaving two teeth embedded, but both continued to feed unperturbed. Smaller individuals hovered around the carcass eating chunks that drifted away. Unusually for the area, large numbers of sharks over five metres long were observed, suggesting that the largest sharks change their behaviour to search for whales as they lose the maneuverability required to hunt seals. It is possible that whale carcasses are an important location for sexually mature sharks to meet for mating. The investigating team concluded that the importance of whale carcasses, particularly for the largest white sharks, has been underestimated. In another documented incident, white sharks were observed scavenging on a whale carcass alongside tiger sharks. Almost nothing is known about the reproduction of great whites. Some evidence points to the near-soporific effect of a large feast (such as a whale carcass) possibly inducing mating. Great white sharks were previously thought to reach sexual maturity at around 15 years of age, but actually take far longer; male great white sharks reach sexual maturity at age 26, while females take 33 years to reach sexual maturity. Maximum life span was originally believed to be more than 30 years, but a study by the Woods Hole Oceanographic Institution placed it at upwards of 70 years. Examinations of vertebral growth ring count gave a maximum male age of 73 years and a maximum female age of 40 years for the specimens studied. The shark's late sexual maturity, low reproductive rate and slow growth make it vulnerable to pressures such as overfishing and environmental change. Little is known about the great white shark's mating habits. Birth has never been observed, but pregnant females have been examined. Great white sharks are ovoviviparous, which means eggs develop and hatch in the uterus and continue to develop until birth. The great white has an 11-month gestation period. The shark pup's powerful jaws begin to develop in the first month. The unborn sharks participate in oophagy, in which they feed on ova produced by the mother. Delivery is in spring and summer. The Northern Pacific population of great whites is suspected to breed off of the Sea of Cortez, as evidenced by local fisherman who have said to have caught them and evidenced by teeth found at dump sites for discarded parts from their catches. A breach is the result of a high speed approach to the surface with the resulting momentum taking the shark partially or completely clear of the water. This is a hunting technique employed by great white sharks whilst hunting seals. This technique is often used on cape fur seals at Seal Island in False Bay, South Africa. Because the behavior is unpredictable, it is very hard to document. It was first photographed by Chris Fallows and Rob Lawrence who developed the technique of towing a slow-moving seal decoy to trick the sharks to breach. Between April and September, scientists may observe around 600 breaches. The seals swim on the surface and the great white sharks launch their predatory attack from the deeper water below. They can reach speeds of up to 40 kilometers per hour (25 mph) and can at times launch themselves more than 10 feet (3.0 m) into the air. Just under half of observed breach attacks are successful. In 2011, a 3-meter (9.8 ft) long shark jumped onto a seven-person research vessel off Seal Island in Mossel Bay. The crew were undertaking a population study using sardines as bait, and the incident was judged not to be an attack on the boat but an accident. Interspecific competition between the great white shark and the orca is probable in regions where dietary preferences of both species may overlap. An incident was documented on 4 October 1997, in the Farallon Islands off California in the United States. An estimated 4.7–5.3-meter (15–17 ft) female orca immobilized an estimated 3–4-meter (9.8–13.1 ft) great white shark. The orca held the shark upside down to induce tonic immobility and kept the shark still for fifteen minutes, causing it to suffocate. The orca then proceeded to eat the dead shark's liver. It is believed that the scent of the slain shark's carcass caused all the great whites in the region to flee, forfeiting an opportunity for a great seasonal feed. Another similar attack apparently occurred there in 2000, but its outcome is not clear. After both attacks, the local population of about 100 great whites vanished. Following the 2000 incident, a great white with a satellite tag was found to have immediately submerged to a depth of 500 m (1,600 ft) and swum to Hawaii. In 2015, a pod of orcas was recorded to have killed a great white shark off South Australia. The IUCN notes that very little is known about the actual status of the great white shark, but as it appears uncommon compared to other widely distributed species, it is considered vulnerable. It is included in Appendix II of CITES, meaning that international trade in the species requires a permit. As of March 2010, it has also been included in Annex I of the CMS Migratory Sharks MoU, which strives for increased international understanding and coordination for the protection of certain migratory sharks. A February 2010 study by Barbara Block of Stanford University estimated the world population of great white sharks to be lower than 3,500 individuals, making the species more vulnerable to extinction than the tiger, whose population is in the same range. According to another study from 2014 by George H. Burgess, Florida Museum of Natural History, University of Florida, there are about 2000 great white sharks near the California coast, which is 10 times higher than the previous estimate of 219 by Barbara Block. As of April 2007, great white sharks were fully protected within 370 kilometers (230 mi) of New Zealand and additionally from fishing by New Zealand-flagged boats outside this range. The maximum penalty is a $250,000 fine and up to six months in prison. While the term "shark attack" is in common use for instances of humans being wounded by sharks, it has been suggested that this is based largely on the misconception that white sharks and other large predatory sharks (such as bull and tiger sharks) seek out humans as prey. A recent review recommends that only in the very rare instances where a shark clearly predated on a human should the bite incident be termed an "attack," which implies predation, and that otherwise it is more accurate to class bite incidents as "sighting", "encounter", "bite incident", or "fatal bite incident". Sightings do not include physical interaction, encounters include physical interaction without harm, shark bites include minor and major shark bite incidents, including those that do and do not require medical attention, and fatal shark bite incidents are those that result in death. The study suggests that only in a case where an expert validates the predatory intent of a shark would it be appopriate to term a bite incident an attack. The great white shark is one of only four kinds of sharks that have been involved in a significant number of fatal unprovoked attacks on humans. Contrary to popular belief, great white sharks do not mistake humans for seals. Many bite incidents occur in waters with low visibility or other situations which impair the shark's senses. The species appears to not like the taste of humans, or at least finds the taste unfamiliar. Further research shows that they can tell in one bite whether or not the object is worth predating upon. Humans, for the most part, are too bony for their liking. They much prefer a fat, protein-rich seal. Humans are not appropriate prey because the shark's digestion is too slow to cope with a human's high ratio of bone to muscle and fat. Accordingly, in most recorded shark bite incidents, great whites broke off contact after the first bite. Fatalities are usually caused by blood loss from the initial bite rather than from critical organ loss or from whole consumption. From 1990 to 2011 there have been a total of 139 unprovoked great white shark bite incidents, 29 fatal. In 2014 the state government of Western Australia led by Premier Colin Barnett implemented a policy of killing large sharks. The policy is intended to protect users of the marine environment from shark bite incidents, following the deaths of seven people on the Western Australian coastline in the years 2010–2013. 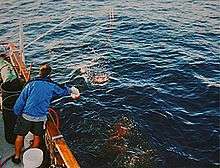 Baited drum lines are deployed near popular beaches using hooks designed to catch great white sharks, as well as bull and tiger sharks. Large sharks found hooked but still alive are shot and their bodies discarded at sea. The government claims they are not culling the sharks, but are using a "targeted, localised, hazard mitigation strategy". Barnett has described opposition as "ludicrous" and "extreme", and said that nothing can change his mind. This policy was met with widespread condemenation from the scientific community, which showed that species responsible for bite incidents were notoriously hard to identify, that the drum lines failed to capture white sharks, as intended, and that the government also failed to show any correlation between their drum line policy and a decrease in shark bite incidents in the region. Great white sharks infrequently bite and sometimes even sink boats. Only five of the 108 authenticated unprovoked shark bite incidents reported from the Pacific Coast during the 20th century involved kayakers. In a few cases they have bitten boats up to 10 meters (33 ft) in length. They have bumped or knocked people overboard, usually biting the boat from the stern. In one case in 1936, a large shark leapt completely into the South African fishing boat Lucky Jim, knocking a crewman into the sea. Tricas and McCosker's underwater observations suggest that sharks are attracted to boats by the electrical fields they generate, which are picked up by the ampullae of Lorenzini and confuse the shark about whether or not wounded prey might be near-by. Prior to August 1981, no great white shark in captivity lived longer than 11 days. In August 1981, a white shark survived for 16 days at SeaWorld San Diego before being released. The idea of containing a live great white at SeaWorld Orlando was used in the 1983 film Jaws 3-D. In 1984, shortly before its opening day, the Monterey Bay Aquarium in Monterey, California, housed its first great white shark which had died after 10 days. In July 2003, Monterey researchers captured a small female and kept it in a large netted pen near Malibu for five days. They had the rare success of getting the shark to feed in captivity before its release. Not until September 2004 was the aquarium able to place a great white on long-term exhibit. A young female, which was caught off the coast of Ventura, was kept in the aquarium's 3,800,000-liter (1,000,000 U.S. gal) Outer Bay exhibit for 198 days before she was released in March 2005. She was tracked for 30 days after release. On the evening of 31 August 2006, the aquarium introduced a juvenile male caught outside Santa Monica Bay. His first meal as a captive was a large salmon steak on 8 September 2006, and as of that date, he was estimated to be 1.72 meters (68 in) in length and to weigh approximately 47 kilograms (104 lb). He was released on 16 January 2007, after 137 days in captivity. Monterey Bay Aquarium housed a third great white, a juvenile male, for 162 days between 27 August 2007, and 5 February 2008. On arrival, he was 1.4 m (4.6 ft) long and weighed 30.6 kg (67 lb). He grew to 1.8 m (5.9 ft) and 64 kg (141 lb) before release. A juvenile female came to the Outer Bay Exhibit on 27 August 2008. While she did swim well, the shark fed only one time during her stay and was tagged and released on 7 September 2008. Another juvenile female was captured near Malibu on 12 August 2009, introduced to the Outer Bay exhibit on 26 August 2009, and was successfully released into the wild on 4 November 2009. The Monterey Bay Aquarium added a 1.4-meter (4.6 ft) long male into their redesigned "Open Sea" exhibit on 31 August 2011. The animal was captured in the waters off of Malibu. One of the largest adult great whites ever exhibited was at Japan's Okinawa Churaumi Aquarium in 2016, where a 3.5 meters (11 ft) male was exhibited for three days before dying. Probably the most famous captive was a 2.4 m (7.9 ft) female named Sandy, which in August 1980 became the only great white to be housed at the California Academy of Sciences' Steinhart Aquarium in San Francisco, California. She was released because she would not eat and constantly bumped against the walls. A number of very large unconfirmed great white shark specimens have been recorded. For decades, many ichthyological works, as well as the Guinness Book of World Records, listed two great white sharks as the largest individuals: In the 1870s, a 10.9 m (36 ft) great white captured in southern Australian waters, near Port Fairy, and an 11.3 m (37 ft) shark trapped in a herring weir in New Brunswick, Canada, in the 1930s. However these measurements are not scientific and researchers have questioned the reliability of these measurements for a long time, noting they were much larger than any other accurately reported sighting. Later studies proved these theories correct. This New Brunswick shark may have been a misidentified basking shark, as the two have similar body shapes. The question of the Port Fairy shark was settled in the 1970s when J. E. Randall examined the shark's jaws and "found that the Port Fairy shark was of the order of 5 m (17 ft) in length and suggested that a mistake had been made in the original record, in 1870, of the shark's length". These wrong measurements would make the alleged shark more than five times heavier than it really was. Several unconfirmed reports of great white sharks caught in modern times with have been estimated to be more than 7 m (23 ft) long, but these claims have received some criticism. However, J. E. Randall believed that great white shark may have exceeded 6.1 m (20 ft) in length. A great white shark was captured near Kangaroo Island in Australia on 1 April 1987. This shark was estimated to be more than 7 m (23 ft) long by Peter Resiley, and has been designated as KANGA. Another great white shark was caught in Malta by Alfredo Cutajar on 16 April 1987. This shark was also estimated to be around 7.13 m (23.4 ft) long by John Abela and has been designated as MALTA. However, Cappo drew criticism because he used shark size estimation methods proposed by J. E. Randall to suggest that the KANGA specimen was 5.8–6.4 m (19–21 ft) long. In a similar fashion, I. K. Fergusson also used shark size estimation methods proposed by J. E. Randall to suggest that the MALTA specimen was 5.3–5.7 m (17–19 ft) long. However, photographic evidence suggested that these specimens were larger than the size estimations yielded through Randall's methods. Thus, a team of scientists—H. F. Mollet, G. M. Cailliet, A. P. Klimley, D. A. Ebert, A. D. Testi, and L. J. V. Compagno—reviewed the cases of the KANGA and MALTA specimens in 1996 to resolve the dispute by conducting a comprehensive morphometric analysis of the remains of these sharks and re-examination of photographic evidence in an attempt to validate the original size estimations and their findings were consistent with them. The findings indicated that estimations by P. Resiley and J. Abela are reasonable and could not be ruled out. A particularly large female great white nicknamed "Deep Blue", estimated measuring at 6.09 metres (20.0 ft) was filmed off Guadalupe during shooting for the 2014 episode of Shark Week "Jaws Strikes Back". Deep Blue would also later gain significant attention when she was filmed interacting with researcher Mauricio Hoyas Pallida in a viral video that Mauricio posted on Facebook on 11 June 2015. A particularly infamous great white shark, supposedly of record proportions, once patrolled the area that comprises False Bay, South Africa, was said to be well over 7 metres (23 ft) during the early 1980s. This shark, known locally as the "Submarine", had a legendary reputation that was supposedly well founded. Though rumors have stated this shark was exaggerated in size or non-existent altogether, witness accounts by the then young Craig Anthony Ferreira, a notable shark expert in South Africa, and his father indicate an unusually large animal of considerable size and power (though it remains uncertain just how massive the shark was as it escaped capture each time it was hooked). Ferreira describes the four encounters with the giant shark he participated in with great detail in his book "Great White Sharks On Their Best Behavior". One contender in maximum size among the predatory sharks is the tiger shark (Galeocerdo cuvier). While tiger sharks which are typically both a few feet smaller and have a leaner, less heavy body structure than white sharks, have been confirmed to reach at least 5.5 metres (18 ft) in the length, an unverified specimen was reported to have measured 7.4 metres (24 ft) in length and weighed 3,110 kilograms (6,860 lb), more than two times heavier than the largest confirmed specimen at 1,524 kilograms (3,360 lb). Some other macropredatory sharks such as the Greenland shark (Somniosus microcephalus) and the Pacific sleeper shark (S. pacificus) are also reported to rival these sharks in length (but probably weigh a bit less since they are more slender in build than a great white) in exceptional cases. The question of maximum weight is complicated by the unresolved question of whether or not to include the shark's stomach contents when weighing the shark. With a single bite a great white can take in up to 14 kg (31 lb) of flesh, and can also consume several hundred kilograms of food. 1 2 Gottfried, M. D.; Fordyce, R. E. (2001). "An associated specimen of Carcharodon angustidens (Chondrichthyes, Lamnidae) from the Late Oligocene of New Zealand, with comments on Carcharodon interrelationships". Journal of Vertebrate Paleontology. 21 (4): 730–739. doi:10.1671/0272-4634(2001)021[0730:AASOCA]2.0.CO;2. JSTOR 20062013. 1 2 "Great white sharks: 10 myths debunked". The Guardian. Retrieved 3 June 2016. 1 2 Carpenter, K. "Carcharodon carcharias". FishBase.org. Retrieved 3 June 2016. 1 2 3 4 5 6 7 Viegas, Jennifer. "Largest Great White Shark Don't Outweigh Whales, but They Hold Their Own". Discovery Channel. Retrieved 19 January 2010. 1 2 Parrish, M. "How Big are Great White Sharks?". Smithsonian National Museum of Natural History Ocean Portal. Retrieved 3 June 2016. ↑ "Carcharodon carcharias". Animal Diversity Web. Retrieved 5 June 2016. 1 2 "New study finds extreme longevity in white sharks". Science Daily. 9 January 2014. 1 2 Ghose, Tia (19 February 2015). "Great White Sharks Are Late Bloomers". LiveScience.com. ↑ Wright, Bruce A. (2007) Alaska's Great White Sharks. Lulu.com. p. 27. ISBN 0615155952. ↑ Knickle, Craig. "Tiger Shark". Florida Museum of Natural History Ichthyology Department. Archived from the original on 7 July 2013. Retrieved 2 July 2009. 1 2 "Carcharodon carcharias". UNEP-WCMC Species Database: CITES-Listed Species On the World Wide Web. Archived from the original on 15 June 2013. Retrieved 8 April 2010. ↑ Hile, Jennifer (23 January 2004). "Great White Shark Attacks: Defanging the Myths". Marine Biology. National Geographic. Archived from the original on 26 April 2009. Retrieved 2 May 2010. ↑ "The Great White Shark". The Enviro Facts Project. Archived from the original on 13 June 2009. Retrieved 9 July 2007. ↑ Portell, R. W.; Hubbell, G.; Donovan, S. K.; Green, J. L.; Harper, D. A.; Pickerill, R. (2008). "Miocene sharks in the Kendeace and Grand Bay formations of Carriacou, The Grenadines, Lesser Antilles". Caribbean Journal of Science. 44 (3): 279–286. doi:10.18475/cjos.v44i3.a2. ↑ "New Ancient Shark Species Gives Insight Into Origin of Great White". sciencedaily.com. University of Florida. 14 November 2012. ↑ Kevin G. N.; Charles N. C.; Gregory A. W. (2006). "Tracing the Ancestry of the Great White Shark, Carcharodon carcharias, Using Morphometric Analyses of Fossil Teeth" (PDF). Journal of Vertebrate Paleontology. 26 (4): 806–814. JSTOR 4524633. Retrieved 25 December 2007. ↑ "Areal Distribution of the White Shark". National Capital Freenet. Retrieved 16 October 2010. 1 2 Thomas, Pete (5 April 2010). "Great white shark amazes scientists with 4000-foot dive into abyss". GrindTV. Archived from the original on 17 August 2012. ↑ Thomas, Pete (29 September 2006). "The Great White Way". "Los Angeles Times". Retrieved 1 October 2006. 1 2 "Great White Sharks, Carcharodon carcharias at MarineBio.org". Marine Bio. Retrieved 20 August 2012. ↑ Echenique, E. J. "A Shark to Remember: The Story of a Great White Caught in 1945". Retrieved 22 January 2013. Home Page of Henry F. Mollet, Research Affiliate, Moss Landing Marine Laboratories. ↑ "Just the Facts Please". GreatWhite.org. Retrieved 3 June 2016. ↑ "ADW: Carcharodon carcharias: INFORMATION". Animal Diversity Web. Retrieved 16 May 2016. 1 2 3 4 Cappo, Michael (1988). "Size and age of the white pointer shark, Carcharodon carcharias (Linnaeus)". SAFISH. 13 (1): 11–13. 1 2 Tricas, T. C.; McCosker, J. E. (12 July 1984). "Predatory behaviour of the white shark (Carcharodon carcharias), with notes on its biology" (PDF). Proceedings of the California Academy of Sciences. California Academy of Sciences. 43 (14): 221–238. Retrieved 22 January 2013. ↑ Taylor, Leighton R. (1 January 1993). Sharks of Hawaii: Their Biology and Cultural Significance. University of Hawaii Press. p. 65. ISBN 978-0-8248-1562-2. 1 2 3 Wroe, S.; Huber, D. R.; Lowry, M.; McHenry, C.; Moreno, K.; Clausen, P.; Ferrara, T. L.; Cunningham, E.; Dean, M. N.; Summers, A. P. (2008). "Three-dimensional computer analysis of white shark jaw mechanics: how hard can a great white bite?" (PDF). Journal of Zoology. 276 (4): 336–342. doi:10.1111/j.1469-7998.2008.00494.x. ↑ "The physiology of the ampullae of Lorenzini in sharks". Biology Dept., Davidson College. Biology @ Davidson. Retrieved 20 August 2012. ↑ Martin, R. Aidan. "Body Temperature of the Great white and Other Lamnoid Sharks". ReefQuest Centre for Shark research. Retrieved 16 October 2010. ↑ Barber, Elizabeth (18 July 2013). "Great white shark packs its lunch in its liver before a big trip". The Christian Science Monitor. Archived from the original on 2 August 2013. ↑ Jordan, Rob (17 July 2013). "Great White Sharks' Fuel for Oceanic Voyages: Liver Oil". sciencedaily.com. Stanford University. ↑ Medina, Samantha (27 July 2007). "Measuring the great white's bite". Cosmos Magazine. Retrieved 1 September 2012. 1 2 3 4 5 6 Martin, R. Aidan; Martin, Anne. "Sociable Killers". Natural History Magazine. Archived from the original on 15 May 2013. Retrieved 30 September 2006. ↑ Johnson, R. L.; Venter, A.; Bester, M.N. ; Oosthuizen, W.H. (2006). "Seabird predation by white shark Carcharodon Carcharias and Cape fur seal Arctocephalus pusillus pusillus at Dyer Island" (PDF). South African Journal of Wildlife Research. South Africa. 36 (1): 23–32. ↑ Estrada, J. A.; Rice, Aaron N.; Natanson, Lisa J.; Skomal, Gregory B. (2006). "Use of isotopic analysis of vertebrae in reconstructing ontogenetic feeding ecology in white sharks". Ecology. US. 87 (4): 829–834. doi:10.1890/0012-9658(2006)87[829:UOIAOV]2.0.CO;2. PMID 16676526. 1 2 Fergusson, I. K.; Compagno, L. J.; Marks, M. A. (2000). "Predation by white sharks Carcharodon carcharias (Chondrichthyes: Lamnidae) upon chelonians, with new records from the Mediterranean Sea and a first record of the ocean sunfish Mola mola (Osteichthyes: Molidae) as stomach contents". Environmental Biology of Fishes. 58 (4): 447–453. ↑ Hussey, N. E., McCann, H. M., Cliff, G., Dudley, S. F., Wintner, S. P., & Fisk, A. T. (2012). Size-based analysis of diet and trophic position of the white shark (Carcharodon carcharias) in South African waters. Global Perspectives on the Biology and Life History of the White Shark. (Ed. ML Domeier.) pp. 27–49. ↑ "Catch as Catch Can". ReefQuest Centre for Shark Research. Retrieved 16 October 2010. ↑ Le Boeuf, B. J.; Crocker, D. E.; Costa, D. P.; Blackwell, S. B.; Webb, P. M.; Houser, D. S. (2000). "Foraging ecology of northern elephant seals". Ecological monographs. 70 (3): 353–382. doi:10.2307/2657207. ↑ Haley, M. P.; Deutsch, C. J.; Le Boeuf, B. J. (1994). "Size, dominance and copulatory success in male northern elephant seals, Mirounga angustirostris". Animal Behaviour. 48 (6): 1249–1260. doi:10.1006/anbe.1994.1361. ↑ Weng, K. C.; Boustany, A. M.; Pyle, P.; Anderson, S. D.; Brown, A.; Block, B. A. (2007). "Migration and habitat of white sharks (Carcharodon carcharias) in the eastern Pacific Ocean". Marine Biology. 152 (4): 877–894. doi:10.1007/s00227-007-0739-4. ↑ Martin, Rick. "Predatory Behavior of Pacific Coast White Sharks". Shark Research Committee. 1 2 3 4 5 6 7 8 9 10 11 12 13 14 Klimley, Peter; Ainley, David (1996). 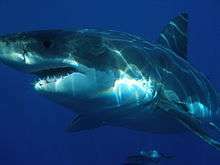 Great White Sharks: The Biology of Carcharodon carcharias. Academic Press. pp. 91–108. ISBN 0-12-415031-4. 1 2 3 4 5 6 Heithaus, Michael (2001). "Predator–prey and competitive interactions between sharks (order Selachii) and dolphins (suborder Odontoceti): a review" (PDF). Journal of Zoology. London: Cambridge University Press. 253: 53–68. doi:10.1017/S0952836901000061. Retrieved 26 February 2010. ↑ Long, Douglas (1991). "Apparent Predation by a White Shark Carcharodon carcharias on a Pygmy Sperm Whale Kogia breviceps" (PDF). Fishery Bulletin. 89: 538–540. ↑ Kays, R. W., & Wilson, D. E. (2009). Mammals of North America. Princeton University Press. ↑ Baird, R. W.; Webster, D. L.; Schorr, G. S.; McSweeney, D. J.; Barlow, J. (2008). "Diet variation in beaked whale diving behavior". Marine Mammal Science. 24 (3): 630–642. doi:10.1111/j.1748-7692.2008.00211.x. ↑ "How Fast Can a Shark Swim?". ReefQuest Centre for Shark Research. ↑ "White Shark Predatory Behavior at Seal Island". ReefQuest Centre for Shark Research. ↑ Krkosek, Martin; Fallows, Chris; Gallagher, Austin J.; Hammerschlag, Neil (2013). "White Sharks (Carcharodon carcharias) Scavenging on Whales and Its Potential Role in Further Shaping the Ecology of an Apex Predator". PLoS ONE. 8 (4): e60797. doi:10.1371/journal.pone.0060797. ↑ Dudley, Sheldon F. J.; Anderson-Reade, Michael D.; Thompson, Greg S.; McMullen, Paul B. (2000). "Concurrent scavenging off a whale carcass by great white sharks, Carcharodon carcharias, and tiger sharks, Galeocerdo cuvier" (PDF). Marine Biology. Fishery Bulletin. Archived from the original (PDF) on 27 May 2010. Retrieved 4 May 2010. ↑ Owens, Brian (12 February 2016). "White shark's diet may include biggest fish of all: whale shark". New Scientist. ↑ Moore, G. I.; Newbrey, M. G. (2015). "Whale shark on a white shark's menu". Marine Biodiversity. doi:10.1007/s12526-015-0430-9. ↑ "Great White Shark Feeding On Whale Carcass". wn.com. ↑ "Natural History of the White Shark". PRBO Conservation Science. 2 May 2010. Archived from the original on 3 July 2013. ↑ "Legendary Great White Shark Was Just A Teenager When Killed, New Research Reveals". The Inquisitr News. ↑ "Carcharodon carcharias, Great White Sharks". marinebio.org. ↑ "Brief Overview of the Great White Shark (Carcharodon carcharias)". Elasmo Research. Retrieved 20 August 2012. ↑ Martin, R. Aidan. "White Shark Breaching". ReefQuest Centre for Shark Research. Retrieved 18 April 2012. ↑ Martin, R. A.; Hammerschlag, N.; Collier, R. S.; Fallows, C. (2005). "Predatory behaviour of white sharks (Carcharodon carcharias) at Seal Island, South Africa". Journal of the Marine Biological Association of the UK. 85 (5): 1121. doi:10.1017/S002531540501218X. ↑ Rice, Xan (19 July 2011). "Great white shark jumps from sea into research boat". The Guardian. London: Guardian Media Group. Retrieved 20 July 2011. Marine researchers in South Africa had a narrow escape after a three-meter-long great white shark breached the surface of the sea and leapt into their boat, becoming trapped on deck for more than an hour. […] Enrico Gennari, an expert on great white sharks, [...] said it was almost certainly an accident rather than an attack on the boat. 1 2 Pyle, Peter; Schramm, Mary Jane; Keiper, Carol; Anderson, Scot D. (26 August 2006). "Predation on a white shark (Carcharodon carcharias) by a killer whale (Orcinus orca) and a possible case of competitive displacement" (PDF). Marine Mammal Science. US: Society of marine mammalogy. 15 (2): 563–568. doi:10.1111/j.1748-7692.1999.tb00822.x. Archived from the original (PDF) on 22 March 2012. Retrieved 8 May 2010. 1 2 "Nature Shock Series Premiere: The Whale That Ate the Great White". Tvthrong.co.uk. 4 October 1997. Retrieved 16 October 2010. ↑ "Killer Whale Documentary Part 4". youtube.com. 1 2 3 Turner, Pamela S. (Oct–Nov 2004). "Showdown at Sea: What happens when great white sharks go fin-to-fin with killer whales?". National Wildlife. National Wildlife Federation. 42 (6). Archived from the original on 16 January 2011. Retrieved 21 November 2009. ↑ "Great white shark 'slammed' and killed by a pod of killer whales in South Australia". Australian Broadcast Company. 3 February 2015. Retrieved 10 July 2015. ↑ "Regulation of Trade in Specimens of Species Included in Appendix II". CITES (1973). Archived from the original on 17 July 2011. Retrieved 8 April 2012. ↑ "Memorandum of Understanding on the Conservation of Migratory Sharks" (PDF). Convention on Migratory Species. 12 February 2010. Archived from the original (PDF) on 20 April 2013. Retrieved 31 August 2012. ↑ Sample, Ian (19 February 2010). "Great white shark is more endangered than tiger, claims scientist". The Guardian. Retrieved 14 August 2013. ↑ Jenkins, P. Nash (24 June 2014). "Beachgoers Beware: The Great White Shark Population Is Growing Again". Time. Retrieved 29 October 2014. ↑ Gannon, Megan. "Great White Sharks Are Making a Comeback off US Coasts". livescience.com. Retrieved 29 October 2014. 1 2 3 Government of Australia. "Species Profile and Threats Database – Carcharodon carcharias — Great White Shark". Retrieved 21 August 2013. 1 2 Environment Australia (2002). White Shark (Carcharodon carcharias) Recovery Plan (Report). ↑ Blower, Dean C.; Pandolfi, John M.; Bruce, Barry D.; Gomez-Cabrera, Maria del C.; Ovenden, Jennifer R. (2012). "Population genetics of Australian white sharks reveals fine-scale spatial structure, transoceanic dispersal events and low effective population sizes". Marine Ecology Progress Series. 455: 229–244. doi:10.3354/meps09659. ↑ "Great white sharks to be protected". New Zealand Herald. 30 November 2006. Retrieved 30 November 2006. ↑ Quan, Kristene (4 March 2013). "Great White Sharks Are Now Protected under California Law". Time. ↑ Williams, Lauren (3 July 2014). "Shark numbers not tanking". Huntington Beach Wave. The Orange County Register. p. 12. ↑ Burgess, George H.; Bruce, Barry D.; Cailliet, Gregor M.; Goldman, Kenneth J.; Grubbs, R. Dean; Lowe, Christopher J.; MacNeil, M. Aaron; Mollet, Henry F.; Weng, Kevin C.; O'Sullivan, John B. (16 June 2014). "A Re-Evaluation of the Size of the White Shark (Carcharodon carcharias) Population off California, USA". PLOS ONE. 9: e98078. doi:10.1371/journal.pone.0098078. ↑ Neff, Christopher; Hueter, Robert (23 January 2013). "Science, policy, and the public discourse of shark "attack": a proposal for reclassifying human–shark interactions". Journal of Environmental Studies and Sciences. 3 (1): 65–73. doi:10.1007/s13412-013-0107-2. ↑ Benchley, Peter (April 2000). "Great white sharks". National Geographic: 12. ISSN 0027-9358. considering the knowledge accumulated about sharks in the last 25 years, I couldn't possibly write Jaws today … not in good conscience anyway … back then, it was OK to demonize an animal. 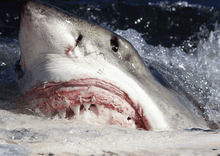 ↑ "Great White Shark Attacks: Defanging the Myths". nationalgeographic.com. ↑ Martin, R. Aidan (2003). "White Shark Attacks: Mistaken Identity". Biology of Sharks and Rays. ReefQuest Centre for Shark Research. Retrieved 30 August 2016. ↑ "ISAF Statistics for Worldwide Unprovoked White Shark Attacks Since 1990". 10 February 2011. Retrieved 19 August 2011. ↑ Tricas, T.C. ; McCosker, John (1984). "Predatory behavior of the white shark, Carcharodon carcharias, and notes on its biology". Proceedings of the California Academy of Sciences. Series 4. 43 (14): 221–238. ↑ "New measures to combat WA shark risks". Department of Fisheries, Western Australia. 10 December 2013. Retrieved 2 February 2014. ↑ "Can governments protect people from killer sharks?". Australian Broadcasting Corporation. 22 December 2013. Retrieved 2 February 2014. ↑ Australia shark policy to stay, despite threats TVNZ, 20 January 2014. ↑ "More than 100 shark scientists, including me, oppose the cull in Western Australia". 23 December 2013. Retrieved 31 August 2016. ↑ "Unprovoked White Shark Attacks on Kayakers". Shark Research Committee. Retrieved 14 September 2008. ↑ Tricas, Timothy C.; McCosker, John E. (1984). "Predatory Behaviour of the White Shark (Carcharodon carcharias), with Notes on its Biology" (PDF). Proceedings of the California Academy of Sciences. 43 (14): 221–238. ↑ "Great white shark sets record at California aquarium". USA Today. 2 October 2004. Retrieved 27 September 2006. ↑ Gathright, Alan (16 September 2004). "Great white shark puts jaws on display in aquarium tank". San Francisco Chronicle. Retrieved 27 September 2006. ↑ "White Shark Research Project". Monterey Bay Aquarium. Retrieved 27 September 2006. ↑ Squatriglia, Chuck (1 September 2003). "Great white shark introduced at Monterey Bay Aquarium". San Francisco Chronicle. Retrieved 27 September 2006. ↑ "Learn All About Our New White Shark". "Monterey Bay Aquarium". Retrieved 28 August 2009. ↑ Hongo, Jun. "Great White Shark Dies at Aquarium in Japan". WSJ Blogs - Japan Real Time. Retrieved 9 January 2016. ↑ "Great white shark dies after three days in Japanese aquarium". Telegraph.co.uk. Retrieved 9 January 2016. ↑ "Electroreception". Elasmo-research. Retrieved 27 September 2006. ↑ "Shark cage diving". Department of Environment, Water and Natural Resources. Archived from the original on 9 April 2013. Retrieved 11 March 2013. ↑ Squires, Nick (18 January 1999). "Swimming With Sharks". BBC. Archived from the original on 17 August 2003. Retrieved 21 January 2010. ↑ Simon, Bob (11 December 2005). "Swimming With Sharks". 60 Minutes. Retrieved 22 January 2010. 1 2 "Blue Water Hunting Successfully". Blue Water Hunter. Archived from the original on 18 August 2012. Retrieved 20 August 2012. ↑ "A Great white shark's favorite tune? 'Back in Black'" Surfersvillage Global Surf News (3 June 2011). Retrieved 2014-01-30. ↑ "Shark Attacks Compared to Lightning". Florida Museum of Natural History. 18 July 2003. Retrieved 7 November 2006. ↑ Hamilton, Richard (15 April 2004). "SA shark attacks blamed on tourism". BBC. Archived from the original on 23 March 2012. Retrieved 24 October 2006. ↑ "White Shark Manifesto-kelp Forests". World News. Retrieved 20 August 2012. 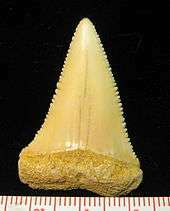 1 2 Mollet, H. F. (2008) White Shark Summary Carcharodon carcharias (Linnaeus, 1758). Home Page of Henry F. Mollet, Research Affiliate, Moss Landing Marine Laboratories. ↑ Jury, Ken (1987). "Huge 'White Pointer' Encounter". SAFISH. 2 (3): 12–13. ↑ "Learn More About Deep Blue, One of the Biggest Great White Sharks Ever Filmed". Discovery. ↑ Ferreira, Craig (2011). Great White Sharks On Their Best Behavior. ↑ Froese, Rainer and Pauly, Daniel, eds. (2011). "Galeocerdo cuvier" in FishBase. July 2011 version. ↑ "Summary of Large Tiger Sharks Galeocerdo cuvier (Peron & LeSueur, 1822)". Retrieved 3 May 2010. ↑ Eagle, Dane. "Greenland Shark". Florida Museum of Natural History. Retrieved 1 September 2012. ↑ Martin, R. Aidan. "Pacific Sleeper Shark". ReefQuest Centre for Shark Research. Biology of Sharks and Rays. Archived from the original on 20 April 2013. Retrieved 1 September 2012. TOPP, Tagging of Pacific Predators, a research group that tags and studies the habits and migration of the white shark.